Participate in a truly ‘Out Of Africa’ experience. You will bring needed aid to those living in disadvantaged situations without access to medical and dental care. The shining faces of children will fill you with delight upon your arrival as you bring much needed aid to those without access to medical services. Venture into their hearts and experience the rich Kenyan culture while caring for them and bringing them hope and inspiration. This premier opportunity will allow volunteers to see every facet of life that Kenya has to offer from the orphanages and informal settlements to the villages and game parks. During this trip you will enjoy a one-day safari and see the world famous Big 5 of Kenya! International Medical Relief continues to make a difference in Kenya as we return to aid survivors in this land of continued healthcare peril. There is a desperate need for more comprehensive health care that includes education. Diseases spread quickly here and quickly become unmanageable. Our clinic camps will be set up exclusively for the IMR team and the entire community will come out to be a part of the clinic. You can expect to see infections of every type, snake bites and wounds, some chronic, others quite acute, and the hypertension and diabetes that plagues the world today. Diagnosis, treatment, and education are equally important in this environment. Your accommodations will be safe and comfortable, with individual beds for each team member. The excellent food, service, and amenities will all help you to recharge and get ready for the day ahead. Transportation will be equally comfortable, with professional drivers, safe vehicles, and plenty to see out the window! Don't forget to look for the zebra herds!! The families will stay with you long after this trip ends. Multi-generational but often missing one entire generation in the middle with HIV/AIDS a common cause of the devastation the missing generation means to the family before you. Grandmothers will bring their grandchildren for your recommendations and expertise; young girls will bring their babies for you to do the same. You'll see many unforgettable things on this trip. SAFARI INCLUDED! After an arduous clinic schedule the team will see up close some of the world’s most amazing animals. On your safari, you will witness the harmony of numerous species of wildlife rarely found in any large quantity anywhere but Kenya. See the abundant wildlife first hand that has made Kenya the leader for adventure wildlife seekers and renowned photographers. In this place like no other, you will have the opportunity to see up close the world’s most amazing animals. You're venturing around the globe, have you considered extending your stay a few additional days to visit some of Kenya's top spots? Join IMR on an exclusive three-day extension! Ready yourself for a wild African safari in some of the world’s most renowned parks. Spend a day at Lake Nakura National Park, where you’ll have the opportunity to spot lions, leopards, buffalo and zebra. Lake Nakura is also home to both white and black rhinoceros. Venture to Maasai Mara, host of the famous Wildebeest Migration each year as 1.7 million wildebeest, more then 500,000 zebra and antelopes cross the swollen Mara River in hopes of finding safety on the Maasai Mara’s sweeping plains. If you are not traveling on the group flight or joining an extension, please contact IMR at office@imrus.org if you wish to arrange transportation between your arrival airport and your clinic location. You and the team will fly into the Jomo Kenyatta International Airport in Nairobi, Kenya on October 5th before 5:00pm. You will transfer to your hotel in Nairobi and have a team dinner, orientation and team meeting this evening. If you are flying on an IMR group flight your airport transportation will be provided for you. If you are flying independently and want to arrange hotel transport through IMR, please contact the IMR office at office@imrus.org. You and the team will travel to different clinic sites each day. Prepare to work together to stop the spread of infectious diseases and minimize this devastation. Our clinic camps will be set up exclusively for the IMR team and the entire community will come out to be a part of the clinic. The children’s shining faces and bright smiles mask the chronic conditions and acute illnesses plaguing their survival. They are filled with delight upon your arrival as you bring much needed care to those without access to medical attention. 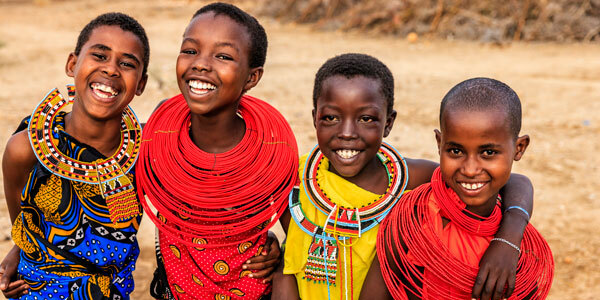 You will experience the rich Kenyan culture while caring for the many families, elderly, and pregnant women that come to clinic, while bringing them hope and inspiration. After clinic, dinner and debriefing with your team will complete your day. Wake up to breakfast at your hotel in Nairobi then drive to the Nairobi National Park with your team! This park is known for the Black Rhino Sanctuary, but you will have opportunities to see zebras, giraffes, lions, and more! After your exciting day at the game park, you will have time to explore Nairobi and do some shopping. Ride back to your hotel with your team for dinner and gear up for another two days of clinic! Today will be another wonderful day of clinic. You'll be welcomed into this community with open arms! Following clinic, join your team for dinner and the nightly debrief. This is your last day in Nairobi! You will have a half day of clinic and a celebratory late lunch. IMR will keep a hotel room for your use to shower, change and get ready for your flight. We are so thankful for all your hard work and hope to see you back soon. Enjoy your flight home and savor the memories! If you would like to extend your stay, contact Worldwide Navigators! Unfortunately, eligibility for the $200 savings on this trip is no longer available after Feb 22nd, 2020. Before Feb 22nd, 2020: YES! IMR will arrange your international flight on a "group" ticket at your request! YES - We need your help to take IMR supply bags internationally to Kenya – Nairobi! Take 2 supply bags for IMR both ways to Kenya – Nairobi. IMR Group Flight: In order to qualify for the IMR Group Flight, you will need to reach 50% of the required donation on or before Feb 22nd, 2020. Early Bird Special: A discount of $200 is awarded to team members who raise / pay 50% of the required donation on or before Feb 22nd, 2020.